RIDGID introduces the GEN5X Brushless 18-Volt Hammer Drill/Driver and 3-Speed Imapact Driver Combo Kit. This kit offers Best-in-Class Power to tackle any jobsite tasks. RIDGID Brushless Motors offer up to 50% more runtime and longer motor life. With registration, this kit is backed by the Industry's Only Lifetime Service Agreement. Get the power of 25,600 BPM with the Ridgid 1/2-inch 18V Lithium-Ion Hammer Drill Kit. Offering an operating speed of up to 1,600 RPM, this powerful drill delivers a maximum hole diameter of 3 1/2 inches, helping you tackle a wide variety of drilling jobs. The 1/2-inch keyless chuck offers quick and easy bit changes, and its cordless design helps reduce extra clutter around your workspace. And the drill's bright orange colour offers great visibility on the jobsite. 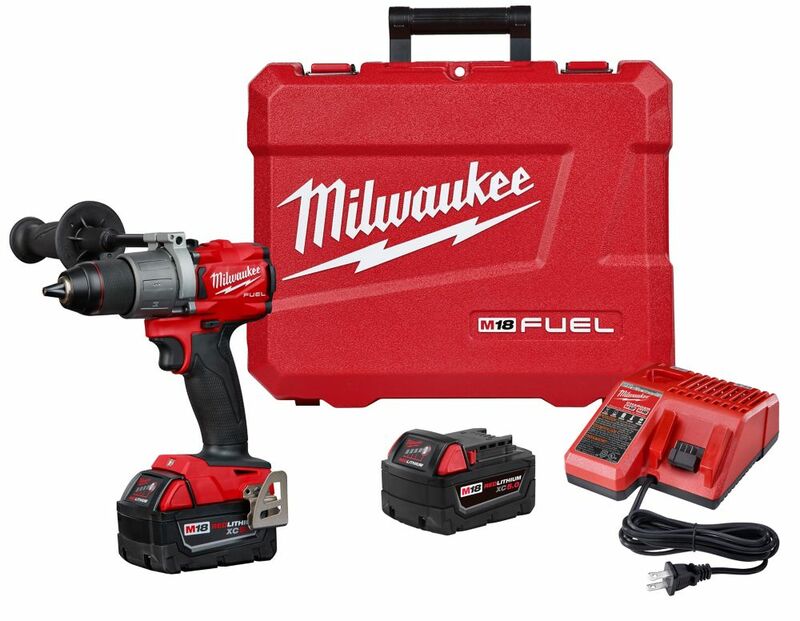 M18 FUEL 18-Volt Lithium-Ion Brushless Cordless 1/2 inch Drill/Driver Kit W/(2) 5.0Ah Batteries The M18 FUEL = inch Drill Driver is the Industry's Most Powerful Drill delivering Up to 60% More Power, is Up To 1.5 inch Shorter and is Up To 2X Faster Under Heavy Load. The POWERSTATE Brushless motor delivers 1,200 in-lbs of torque and 2,000 RPMs providing fast drilling through demanding applications. At 6.9 inch in length this is the most compact drill in its class giving better access into tight spaces and reducing fatigue. The REDLINK PLUS intelligence ensures maximum performance and protects from overloads, heating or over-discharge. The REDLITHIUM XC5.0 Battery Pack delivers more work per charger and more work over the life of the pack than competitors. The all metal ratcheting chuck is the best in class by providing increased bit grip strength and corrosion resistance. M18 FUEL 18-Volt Lithium-Ion Brushless Cordless 1/2 inch Drill/Driver Kit W/(2) 5.0Ah Batteries is rated 4.8 out of 5 by 17. Rated 5 out of 5 by thiimlton from great product- use it with the K drill ice auger. Already had one - got one for my son. great product- use it with the K drill ice auger. Already had one - got one for my son. Rated 4 out of 5 by Nick from The clutch is not like that of other drills I... The clutch is not like that of other drills I have owned. Takes some getting used to. Rated 5 out of 5 by Iceman from Drill has two batteries, charges quickly, performs well.... Drill has two batteries, charges quickly, performs well. Rated 5 out of 5 by JoeW from The drill is excellent. I had trouble with one... The drill is excellent. I had trouble with one of the batteries flashing red and green when trying to charge it, but I repositioned several times, and it worked fine. Rated 5 out of 5 by HomeDepotCustomer from Hands down best drill out there. Would highly recommend. ... Hands down best drill out there. Would highly recommend.